« CSA Pre-season starts January 11 & 12! It’s preseason, and the most January of Januaries I can remember with frozen snow and 5 days of school closings. Still, the Farmers Fresh CSA farmers worked some serious overtime to get all the produce in before Snow Jam ’11 and then out to us afterward. Here’s what I got for my first preseason Family pack delivery. Whew! That’s a lot of food, but we’ve got two weeks to use it. The first week, we’ll make the most of the butterhead lettuce and baby spinach with large salads. 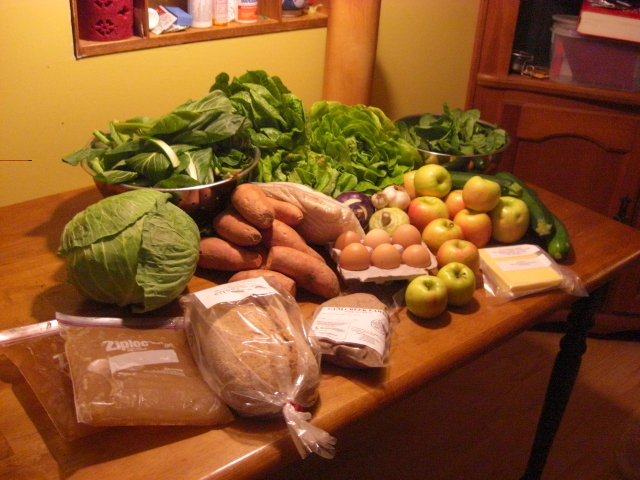 The Romaine will last a little longer and the Komatsuna and cabbage, longer still. We’ll have afternoon snacks of cheese, bread, and apples until all are gone. I’m going to freeze half of this loaf. The bakers at Magnolia Bread don’t recommend putting bread in the refrigerator; it’s in freezer or on the counter. Because Chris and I have a hard time getting through a whole loaf before it starts to mold, I’ll put half of this in the freezer now. The kohlrabi bulbs, the large Komatsuna stems (Larger than the diameter of a pencil is one rule of thumb. ), and a bulb or two of garlic will star in a stir-fry sometime during the next couple of weeks. I’ve been enjoying stir-fries more since making my own sauces of soy sauce, fish sauce, and sherry plus a little sesame oil and rice vinegar. (Who knew sherry was the secret to Chinese cooking? My mother did when I asked her about it. But who else?) I’ve been stretching the sauce with pasta water, but next time I’ll use either this vegetable broth or my own chicken broth I made last week. Can’t wait! The sausage is a real treat, but for now it’s going in the freezer. I’ve got some poultry and meat in there I need to cycle through before cooking something new. I’d recommend trying this sausage first as just plain old patties. That will give you a sense of how good the flavor is before covering it up with other flavors. I’ve got recipes that call for sausage, but I rarely use them because the sausage is so perfect on its own. It’s the same with the eggs; try them just scrambled at some point to taste the difference between fresh, local eggs and their store-bought cousins. You could have an incredible snow day breakfast with sausage, eggs, and grits. The Komatsuna greens will get sautéed with raisins and walnuts. This is one of our favorite dishes, and it is based on Cartoon Kitchen’s Kale with Raisins and Pine Nuts recipe. 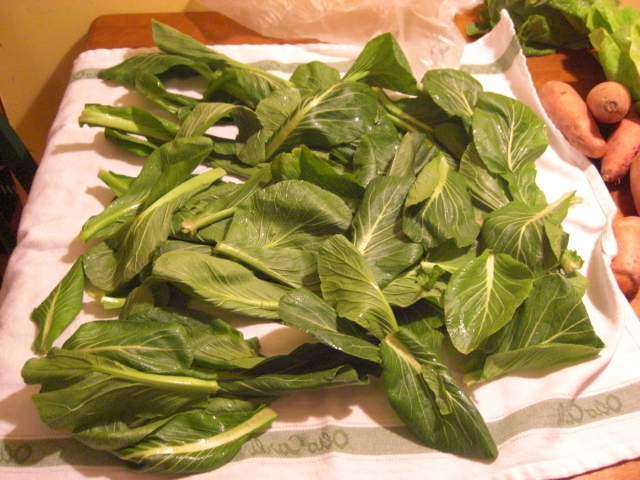 Komatsuna are delicious greens and the least bitter of the family. So if you’re greens-shy, start with these and see what you think. My Komatsuna greens arrived rather wet. With all the produce, I dump it out of the plastic bags to inspect it and then turn the bag inside out before putting the bag in the crisper. I like to believe this is a form of moisture control. Sometimes, however, the produce is simply too wet, so I spread it out on a towel while I deal with the rest of the contents. I probably should have done the same with the baby spinach. I’ll reinspect it today. There are some bad spots on the potatoes, so you need to cut those off leaving you with deformed or shortened potatoes. Plus you want to make sure there aren’t any hidden bad spots inside. The number or size of potatoes you have doesn’t match the number you need to serve. Four people and three good-sized potatoes and one runt – who gets the short end? So preheat the oven to 350 degrees. Peel the potatoes, removing any icky spots, and chop them in very rough half-inch squares. Toss them in a bowl with some olive oil, salt, and pepper and roast them on a rimmed pan for about 20 minutes, checking and turning halfway. They’ll get soft and a little brown when they’re ready. This recipe also works with butternut, acorn, and Kabocha squash as well as real potatoes. A couple of my sweet potatoes has some really icky spots on the ends, so I was in a hurry to use those. We chopped them up and roasted them as described above, and they were delicious. We also had some of the grits and a salad made with the Bibb or Butterhead lettuce topped with green onions, Asian turnips, and organic vinaigrette dressing from last year’s deliveries, feta cheese (from Kroger), and some beets I picked up at the Decatur Farmers Market last week. Even being from the South, I’d always thought of grits as the stuff you get at Waffle House. But these grits are a completely different animal and have tremendous texture and flavor. They have weight without being heavy. (And no need to add the cheesy-flavoring!) I usually make a double recipe, so we get some for breakfast the next morning. And I always use milk instead of water. Or at least half milk. Mmmm… grits. We will definitely be well-fed and well-entertained for the next couple of weeks. Susan, Looks great and an informative read as always. Kohlrabi is not a common veggie; I hope you’ll do a post with kohlrabi featured and maybe its photo. I can’t pick it out in the group shot. Good tip on the sweet potatoes; sorry they had icky spots but like you said, they’re still quite usable as long as you don’t try to store them too long. 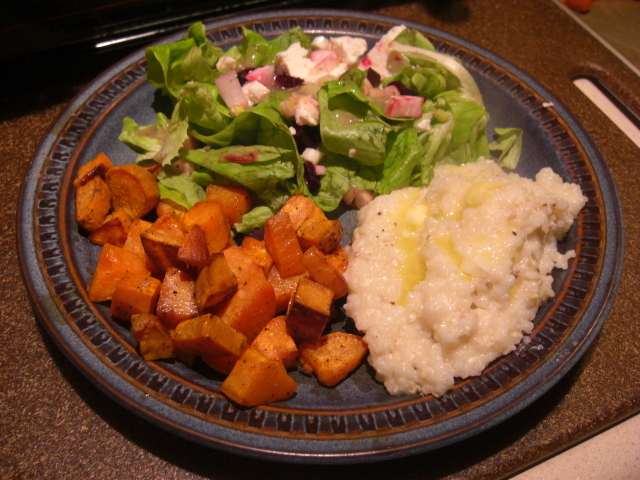 The sweet potatoes, spinach salad, grits combo is definitely one I will try before the sweet potatoes are all gone! Thanks for stopping by, Fran! I’ll definitely post about what happens with the kohlrabi. Oh, that all looks so nummy!!! I have to say that I always put some form of stock or broth in my grits. I usually put milk (or the last of the half & half, or the last nudge of that cream), butter, and some kind of broth. If the grits say they take 5 minutes to cook I cook them for 30 minutes, repeatedly adding more broth or water and stirring more, almost the way one makes a quality risotto. The results are beyond amazing. Once the grits are done, then I flavor them for the dish. Sometimes that’s cheese, sometimes that’s herbs… thyme make a great addition, as does goat cheese. Great gritsy advice, Jenna! Thanks for posting!